In this article, I will address frequently asked questions and answers regarding spousal sponsorship in order for you to further understand what a spousal sponsorship entails. A spousal sponsorship is created for Canadian citizens and permanent residents of Canada who desire to sponsor their spouse to Canada permanently. Essentially, it was intended to give Canadian citizens and permanent residents the opportunity to reunite with their spouses. It is stated that individuals live a better life when they are united with their families. 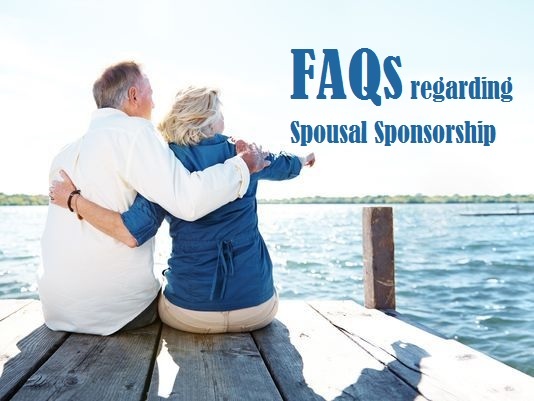 If you believe you would be eligible to apply for a spousal sponsorship, I suggest you read our article on “How Can I Sponsor my Spouse” before reading this question and answer article. This article has been created to clarify any misunderstanding or confusion with regards to a spousal sponsorship. Q: When should I submit my police certificates for my spousal sponsorship application? A: Immigration has made recent changes regarding police certificates and when to submit these documents. If, by chance, you already have police certificates, then you may submit them with your application. However, if not, then Immigration will request this from you and will indicate the time frame that you have in order to appropriately submit them. You will most likely receive this communication either by email or by mail, depending if you have an online account or if you have submitted in paper form. Q: What are the new changes to the Spousal Sponsorship program? Q: Have the eligibility requirements changed also for the Spousal Sponsorship program? Q: If I applied for my spousal application using the old application package, what am I supposed to do for my medical examination? A: This is a very good question. If you have submitted your application using the old application package on or after February 1, 2017, then you need to submit your application with the new package. Immigration Canada is no longer accepting old application packages; this commenced on January 31, 2017. Furthermore, once you have submitted the new application package, Immigration will then notify you on when to do the medical examination. Q: If and when I immigrate to Canada, which family members can accompany me? A: The family members that can accompany you to Canada permanently are any family members included on your application for permanent residents as dependents. This would include your spouse, common-law partner, conjugal partner, dependent child, your spouse’s dependent child or the dependent child of a dependent child. Additionally, there are family members that may not accompany you to Canada. This would include your parents, grandparents, brothers or sisters, aunts or uncles, nephews or nieces, or any other relatives. Specifically for restricted family members, there are other types of sponsorships available. Q: Will I receive a notification that IRCC has received my application? A: Yes, IRCC will notify you that they have received your application either by email or by mail with your application number and unique client identifier (UCI) number. Usually, this notification will be sent once the application has begun processing. Therefore, there may be a delay between the date that IRCC received your application and the day that IRCC begins to process your application. Q: If I had my application returned to me, does this mean I am refused? A: Not necessarily. Your application may be returned back to you for several different reasons. For instance, Immigration may return your application to you if they see that your application is incomplete or the government fees are missing. Additionally, other reasons for applications being returned include Immigration receiving the application after the program is put on hold, closed or the cap has been reached. Keep in mind, IRCC will most likely let you know the reasons for why they are returning your application either by email or by mail. Should you need further information on why your application is returned, you may do so by filling out the IRCC Web Form. Should you have any further questions or feel confused or unclear about how to apply for a spousal sponsorship, it is important to ask questions and discuss your concerns. By talking to immigration professionals about your concerns, this will ease your worries and assist with the application process. Many immigration applications are difficult to pursue on your own, if you are unfamiliar, and it is highly recommended that you seek out professional and experienced help before attempting to apply. Here, at Akrami & Associates, we work and have experience with many different immigration issues. We have helped many of our clients apply for spousal sponsorship and proceed to gain permanent residence in Canada. If you believe that you may be eligible for a spousal sponsorship, please feel free to contact Akrami & Associates at our office at 416-477-2545 for more information or if you would like to book a consultation with an immigration professional for more advise.